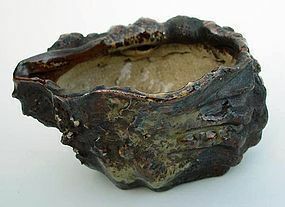 Heavily glazed Japanese katakuchi bowl in the shape of a “Sazae” turban shell. Written on the lid is “made by Matsuyama” and “kashiki” (dish for serving sweetmeats). On the reverse side, there is a signature, "Kei Ho-o En" with a seal. We are not quite sure if this is an original box. Meiji, late 1800s. Great bowl for the kaiseki cuisine? A hairline crack (enlarged photo #7) is a surface crack (does not go through to the other side). Approx. dimensions: 6 3/4" x 6" x 3 1/2" deep.